Human or livestock or wildlife health can’t be discussed in isolation anymore. There is just one health. And the solutions require everyone working together on all the different levels. One Health. What is it? Who uses it? Why is One Health important? It is the concept that animals, people, and environment are all determinants in the transaction of diseases and occupational injuries. The calves are being fed and the pigs are rolling in mud. These activities have an impact on the farm workers and the environment. Seems simple, right? Well, the difficulty lies in assessing the connections between people, animals, and the environment to further understand how zoonotic diseases (diseases spread between animals and humans) and occupational injuries can be eliminated. Carrie Klumb, Senior Epidemiologist at the Minnesota Department of Health (MDH), and her colleagues have been working to understand and limit the spread of zoonotic diseases. Their research shows the burden of enteric zoonoses (e.g. ; E. coli O157, Campylobacter, Cryptosporidium) among those who live or work on a farm is much higher than previously thought. As a result, Carrie and her colleagues are collaborating with the Minnesota Board of Animal Health, Minnesota Department of Agriculture, and the Minnesota Department of Health Environmental Health Division to produce informative and educational resources for farmers and agricultural workers in Minnesota! Pete Raynor, Professor in the Division of Environmental Health Sciences in the School of Public Health at the University of Minnesota, is conducting research to explain how airborne influenza and other virus-containing particles may be transmitted between humans and animals through animal agriculture. His team’s goal is to identify and develop samplers in order to understand the behavior of infectious viruses in animal agriculture along with the risks of transmission between humans and animals and among species of livestock and poultry. Jeff Bender, Co-Director of the UMASH Center, has applied the One Health concept to needlestick prevention and sharps disposal. Over 80% of farm workers vaccinating animals have accidentally stuck themselves. By using proper methods and protective equipment, farmers can protect themselves from exposure to veterinary biologics. Disposing of sharps appropriately protects the environment as well. A comprehensive needlestick prevention program and sharps disposal reinforces the One Health approach. Our recent UMASH forum: Building Resilient Agricultural Communities embodied One Health in action. This forum brought together diverse stakeholders and disciplines including government/regulatory bodies, non-profits, farmers, health professionals and Extension services. This was an opportunity to combine efforts and create partnerships addressing mental health and well-being in our agricultural communities. Together, Carrie, Pete, Jeff and many others at UMASH are conducting research and outreach that is crucial to the understanding of zoonotic diseases and occupational injury prevention along with the benefits that coincide with a One Health approach. Nowhere is remote and no one is disconnected. Join us November 3rd as we celebrate One Health Day and continue to find the challenges and benefits of working with people, animals, and the environment. 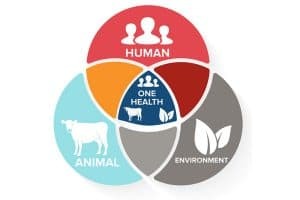 For more information about One Health and how UMASH is using its model, watch our informative One Health Explained video.